A huge percentage of Tylluan’s correspondence has always included queries about psychic self defence. Whether it is living with a ghost, dealing with entities, psychic vampires or simply clearing an area or protecting oneself, many of us encounter these problems from time to time. And if this happens, it pays to be prepared. 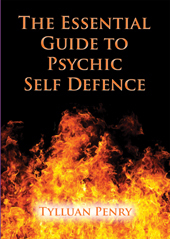 The Essential Guide to Psychic Self Defence is Tylluan’s third book, again published with Capall Bann (in 2010). It draws heavily on the author’s own personal knowledge of hexing from childhood (she was brought up in a family of witches) and is written to reassure readers, not alarm them. Knowledge is power, and being forewarned what to expect is to be forearmed. The book is divided into two main parts: Part 1 deals with the most common problems, while Part 2 lists the solutions. It contains a huge range of topics, including vampires (physical, emotional and psychic), werewolves, and even advice on a pagan exorcism! The book is fully and extensively referenced with a bibliography to enable readers to explore more on specific topics if they wish. Don’t forget that all books ordered from The Wolfenhowle Press can be autographed and/or inscribed by Tylluan. Please either let us know when you place your order, or email us at info@thewolfenhowlepress.com letting us know what you would like Tylluan to write, either to you or to the intended recipient. The number of people worried about being psychically attacked has increased markedly in recent years. This is almost certainly a result of people’s great awareness of both their own psychic ability and potential negative forces around them. This book is a complete guide to this fascinating subject, containing advice on a wide range of options and techniques to deal with almost any psychic problem you could encounter. It covers psychic attacks, curses or hexes, and probably the most common problem, simple negativity. It is a very balanced book giving repeated reassurance that most suspected attacks are no more than mind games, over active imagination or just plain co-incidence. Reading this book will give you peace of mind that if you are ever unfortunate enough to experience a psychic attack you will be able to easily defend yourself. This is an essential book for anyone involved in Wicca, Witchcraft or Magic of any kind, and it is easy to read and understand too. I have finished the book and actually concentrated on the self-hexing. I have to say I feel a lot better now. It was uncanny how many family sayings and practices I found there in. I have also spent quite a bit of time washing mirrors including one which the family always complained about although I did not understand why, when I was a child. It however was really cruel but improved considerably after washing with salt and water. Well thank you, a really useful book which filled in many gaps for me and also answered many questions the answers to which had previously eluded me despite my efforts. My family originated form Suffolk and it was interesting to come across the odd bit of folklore from that area. I am sure your book will be a useful source of reference from now on in. Thank you.